Salesforce Consultants to Help Maximize Your Investment Quickly. 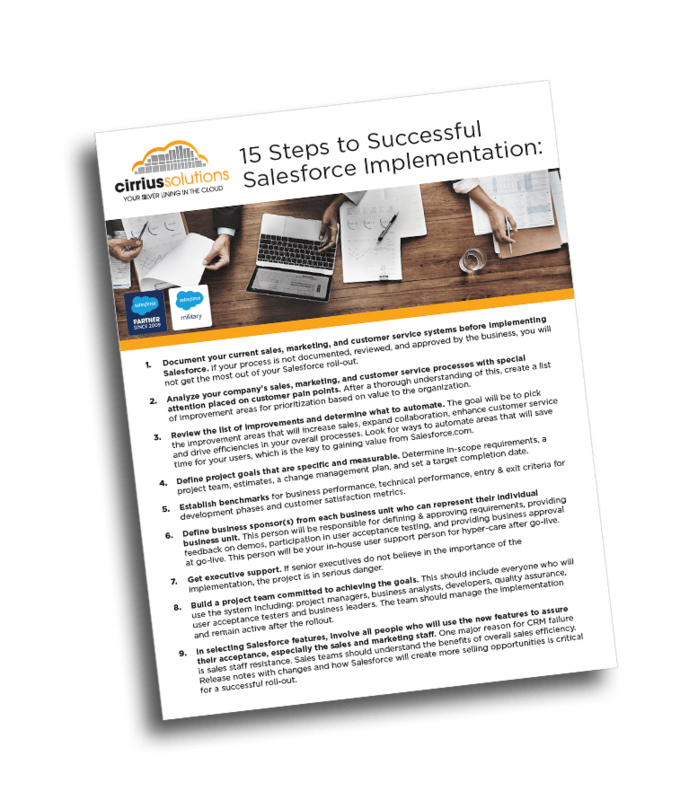 Engaging a Cloud Silver Partner like Cirrius Solutions with certified salesforce consultants that have a wealth of experience will add immediate value. 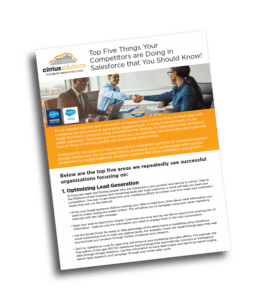 Salesforce.com is a powerful and complex application used by thousands of organizations across the globe to increase their sales, drive marketing effectiveness and automate their support processes. With the ease of customization, a large number of third-party applications and the continuous stream of new features if can be overwhelming to keep up. That’s where we can help. Our Salesforce consultants live and breathe Salesforce so you don’t have to. 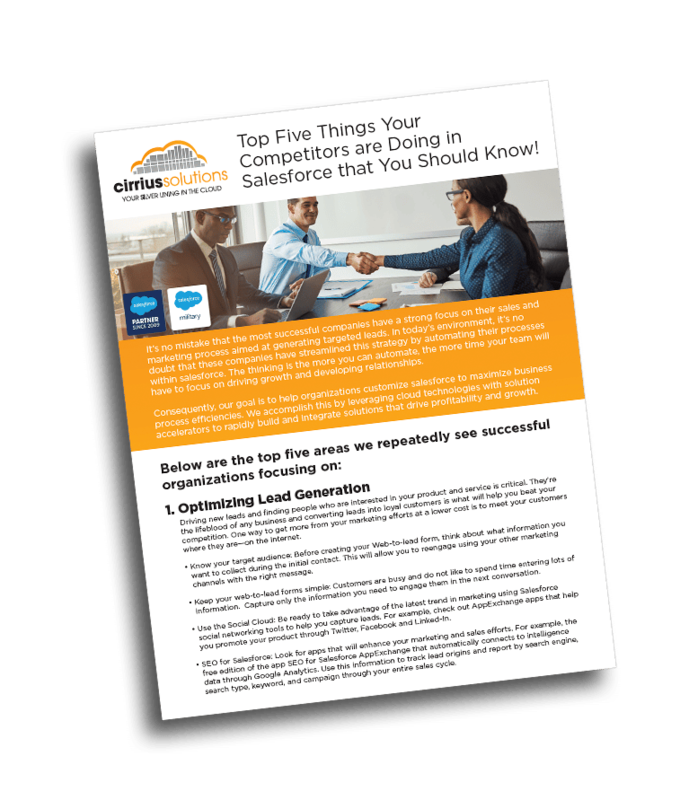 As a Certified Salesforce.com Cloud Silver Alliance Partner, Cirrius Solutions has helped over 250 clients across the US and Europe maximize their investment through advanced customizations. We help the majority of our customers because their initial setup did not maximize their investment and the system is not meeting expectations. Our team of certified Salesforce consultants will help you achieve cleaner more organized data, automate your workflow process, extend mobile capabilities and utilize enhanced analytics to show your executive team the added benefit from your Salesforce roll-out. One of our first steps in any integration is to listen to our client users and to work closely with them throughout the project. This ensures that the client has maximum involvement throughout the entire process providing a customized, holistic approach that drives the utmost value. Our staff of experienced Salesforce consultants include business analysts, solution architects, development experts and quality assurance professionals. Our Projects are completed faster and done right the first time! I promise you experience does matter, which is why we hire only the best and the brightest to be part of the team. The data in your CRM is used to make business decisions and to support process automation. If the data surfaced in reports and dashboards and used for process automation is bad, then poor decisions are made and automated processes are less effective. Simply put, users stop trusting the CRM data and start questioning its value. We have success stories from implementations from over 250 successful Salesforce implementations ranging in size from 50-4000 users. Our customers are all sizes across all industries such as; high-tech, financial services, healthcare professional services, distribution, and retail. Successful CRM implementations aren’t just about the software. Over 20 years of CRM implementation experience is embedded in our best practice methodologies. Customers work with Cirrius Solution because they like our straight talk approach to business. We talk about business opportunities and how to increase productivity and grow top line sales. When you choose us, you will get a better experience, using expert Salesforce consultants who will deliver on time and within budget.